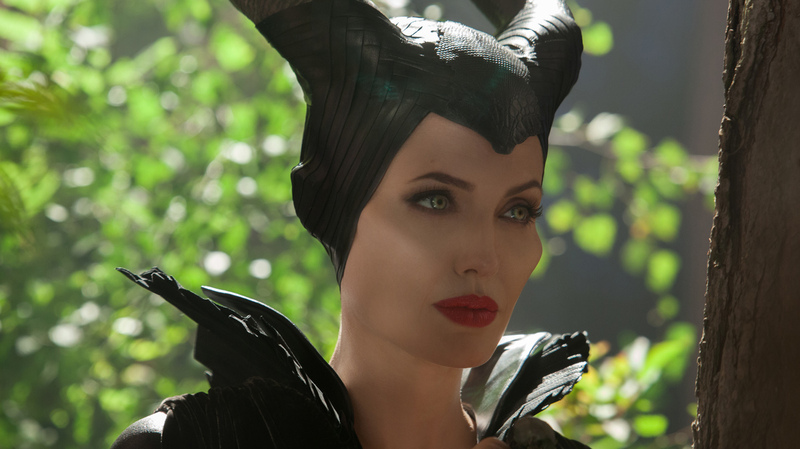 Maleficent rehabilitates the most maligned figure in the fairy tale canon. Of all Disney heroines, Aurora, aka Sleeping Beauty, was the least inspiring. Not her fault: How much spark can you wring from a Forever Nap, especially one that's cut off by a kiss from a prince named after the Duke of Edinburgh? Which may be why my 16-year-old, who's going through one of those inexplicable regressions into Disney toddler fare that seem to hit girls in their teens and beyond, made it through all of five minutes of the 1959 Sleeping Beauty, then went back to binge-watching Buffy the Vampire Slayer. But my girl really grooved to Maleficent and, in a rare confluence of intergenerational pop taste, so did I. And after all, what's not to like when the spotlight shifts to the (allegedly) wicked fairy, as channeled through the bone structure of Angelina Jolie? I say allegedly because Maleficent, capably directed by Robert Stromberg from a sharp script by Linda Woolverton (who also wrote Disney's Beauty and the Beast and The Lion King) sets out to explain why the chilly lady turned into such a hater. That's a very American question: The vibrantly pre-Freudian Brothers Grimm, who wrote the 1812 Briar Rose story that built on Charles Perrault's 1697 original tale, regarded both evil and good as immutable character traits that needed no explanation. The battle between them was the story. Maleficent muddies those waters in ways that may upset moviegoers looking for visceral action, though it surely doesn't lack for battle scenes. At its core the film wants us rooting for the bad fairy, and, to push things a little further, to suggest that humans make much more natural evildoers than their ethereal neighbors, especially when rendered in 3D. We meet young Maleficent (played by Isobelle Molloy, then Ella Purnell), parentless but frolicking happily in The Moors, a fairyland landscape more out of Maurice Sendak than the happiest place on Earth. No tweety-birds hopping around this live-action paradise — only gnarly tree-monsters and wonderful toad-goblins, as devoted to their de facto queen as they are terrified of her anger. And why not? Maleficent has two fancy, big horns and a massive wingspan that helps her repel invaders from the all-too-human monarchy next door. The Moors, by contrast, is a democracy that needs no royalty because it functions on mutual trust. Enter Stefan (Sharlto Copley, and someone tell me please, why is it that so many Disney characters speak Glaswegian these days? ), a rank careerist who, under cover of sweet nothings, brutally reduces poor Maleficent's powers, then rushes back home to lobby for leadership. Thus is born Maleficent the Avenger, now fully grown and ready to crash the christening party of Stefan's baby daughter, Aurora. You may think you know the rest, but watch for all manner of interesting twists, beginning with Angelina Jolie, who even in jutting cheekbones, Spock ears and ruby-red lips set off by the usual deathly pallor, is surely the most quietly inscrutable wicked fairy to walk this digital Earth. It hardly matters that Jolie's accent rambles a bit between pungent Cockney and plummy Buckingham Palace. She's a Presence who mostly strides around, green eyes a-glitter, doing magic things with her long fingers like sending humans flying, turning creatures into other creatures the better to do battle, and putting dweeby visiting princes to sleep as needed. No wonder Aurora, on the cusp of 16 and played as a high-spirited enthusiast by the captivating Elle Fanning, is more impressed by Maleficent than she is by the three incompetent good fairies (wittily played by Juno Temple and two actresses better known for playing women of woe in Mike Leigh movies) who can't seem to focus on caring for their young charge. No spoilers here, but suffice it to say that Maleficent doesn't just rehabilitate the most maligned figure in the fairy tale canon and place brackets around received notions of naughty and nice. More daringly, the movie places a giant question mark around who in all of Fairyland make the mommies dearest, or even the fairest lovers of all. We are cautioned not to take this the wrong way — but blink and you might miss Prince-y (Brenton Thwaites) hovering redundantly over the finale. When you stop to think about the implications of who in this innovative retelling gets to arouse the damsel from her truncated snooze, Uncle Walt must surely be shouting "cut!" from the grave.